In this post I wanted to give an example of how you can use embedded content to complement a Google Data Studio report. In this case I’ve chosen to focus on the Alien Film Franchise, because why not? So for this example, I’ve taken some data about box office performance for the six canon Alien films. The two abyssal AVP films were not invited to join in. So in the Data Studio report below I’ve included embedded external content in the form of YouTube videos and a gif. You’ll need to click the Google Data Studio logo to view the embedded content properly. 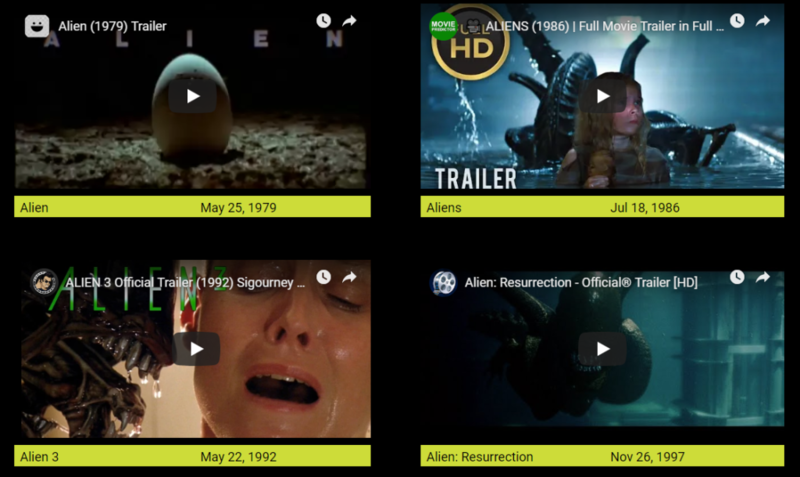 What you should see, assuming everything is loading correctly, is a selection of film trailers for the franchise. Below I’ll give some practical examples of how why you would want to use embedded external content in your reports. Can show the content right next to the data about the content. For example, let’s say you were running various video ads on YouTube. You could have embedded videos of each ad next to the data about them. Similarly, if you want to include data about the website performance of various pages you could include embedded copies of each page. I hope this Alien Data Studio report is a useful example of what’s possible with embedded content in Data Studio.